Please test the keyboard keys when using the OneLoupe! (Image-1) The magnifier in 2 x Zoom on Windows 10! Sometimes there are situations where text, pictures and other items need to be displayed on the screen. For such cases, there is a simple system utility Screen Magnifier. I think almost all of you have found a similar program in earlier versions of Windows. 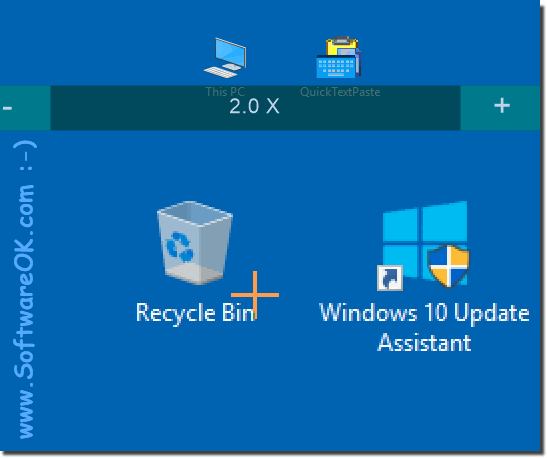 This is an alternative application for Windows 10 and 8.1. Full Screen - This option can also be activated, but not the default settings. Zoom in on the area following the mouse pointer. If you are working on a tablet, you will find the "+" and "-" buttons at the corners of the magnifying glass. Use these buttons to adjust the magnification of the magnifier. If you click on the fields between these buttons, you can move the magnifying glass around the screen. OneLoupe - FAQ-3: If you could remove the mouse focus of the magnifier? If you could remove the focus from the mouse and the screen magnifier screen magnifier, however, retains current settings for without it closes, would open up entirely new possibilities: This could be a desktop area on 2 Monitor always represent increases over the magnifying glass, or would you use it the way a kind of clone mode with different resolution / subarea.